This article covers the history of Haiku, a free, open-source operating system. The development project began as "OpenBeOS" in 2001 after Palm, Inc. bought Be Inc. and discontinued BeOS, leaving BeOS users without a viable upgrade path and BeOS developers with programs stranded on an unsupported platform. OpenBeOS differed from several other contemporary projects aiming to continue BeOS. For example, Cosmoe and BlueEyedOS (both of which remain incomplete and appear to be inactive at this time) took an existing Linux or BSD kernel and re-implemented Be's APIs on top of it; this broke binary code compatibility with BeOS R5 and significantly deviated from the original design. By contrast, OpenBeOS planned an almost complete rewrite of the system, maintaining binary and source code compatibility. This should allow any existing BeOS R5 programs to run on the new system without being recompiled. A first release of OpenBeOS was made in 2002. That release was no stand-alone operating system, instead it was a community-created update for BeOS 5.0.3 that contained open source replacements for a few BeOS components. In 2004 a new project name was chosen in order to avoid infringing on Palm's trademarks. The name was influenced by an official community vote, decided by project leaders and revealed at that year's WalterCon. The name "Haiku" intends to reflect the elegance and simplicity that attracted many to the BeOS platform, and is also a direct reference to the distinctive haiku error messages found in NetPositive, the default BeOS web browser, and many other Be applications. Haiku, Inc., a non-profit organization based in Rochester, New York, was founded in 2003 by former project leader Michael Phipps to support the project and the development of the Haiku operating system. On April 29, 2002 OpenBeOS app_server prototype 5 was released. 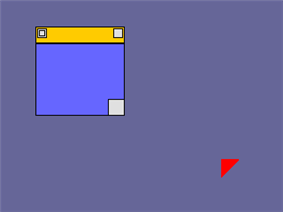 It was the first release that was able to render windows. A number of major milestones were achieved in a six-week period during March to April 2005, such as the first graphical applications to run on Haiku itself (running with full 2D acceleration), and the first use of a web browser (Links) on Haiku. Haiku does not use any code or binaries belonging to Be, Inc., including the drivers used for the graphics and network card in the original examples. Another major milestone was reached in July 2005, when the system was able to run the BeOS desktop shell, Tracker. In October 2005, Axel Dörfler, one of the most prolific Haiku developers, became the first full-time paid Haiku developer, working via funds donated by the community. He worked on CD booting, SMP and other kernel and app_server work. His employment continued until December 2005, when the funds allocated ran out. Work on the operating system continued; Haiku could now be booted and was semi-usable, however much work remained before a release could be made. Network and Universal Serial Bus (USB) functionality were under heavy development, but the media_server lagged behind the other components. Haiku was still quite unstable, as should be expected in its pre-release state, as crashes had been prevalent and no release date had been set. As of January 2006, project developer Stephan Aßmus suggested that at the current level of development, R1 was at least a year away, maybe two. In August 2006, Haiku celebrated its fifth anniversary. Development on the aforementioned network and USB stacks continues rapidly, and it is expected that once these two last major remaining pieces of the operating system are complete, Haiku will be suitable for day-to-day use by developers and testers. After a new website was launched, a contest was held to create Haiku's default icon set. The winner was Stephan Aßmus's set, "stippi". Aßmus was also the developer responsible for Haiku's icon creation tool, Icon-O-Matic, and integrating Haiku's own format of scalable vector graphics, Haiku Vector Icon Format (HVIF) into the Deskbar and Tracker. A partial implementation of the set can be found in the latest builds. In January 2008, an official Java for Haiku team was created and was unanimously accepted by the OpenJDK Porters Group to port OpenJDK to Haiku. In April 2008, Haiku became self-hosting, which means Haiku can be built from within itself. On January 31, 2009, Haiku obtained a native GCC4 port; this allows modern applications, like Firefox 3, to be built on Haiku. On July 12, 2009, a first prototype version of the FreeBSD WLAN-Stack was ported to Haiku, enabling unencrypted WLAN connections as a first step. Original Haiku R1 Alpha 1 CD. The picture was taken inside of the Microsoft Research & Development Center, Haifa, Israel. 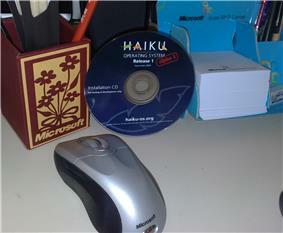 The first alpha release "Haiku R1/Alpha 1" has been released on September 14, 2009. On October 27, 2009, Haiku obtained Qt4 support via an external 3rd party port. The second alpha release ("Haiku R1/Alpha 2") was released on May 10, 2010. After having been distributed with the BeOS Firefox 2 port, ports of Links or NetSurf, Haiku now has its own web browser, WebPositive. "Haiku R1/Alpha 3" was released in June 2011, featuring a large number of improvements and big fixes, including support for both GCC 2 or GCC 4 (use of the latter being discouraged for compatibility reasons). "Haiku R1/Alpha 4" was released on November 12, 2012, with an intended purpose to provide "third party developers with a stable version for testing and development". ^ Stephan Assmus (2006-01-31). "Re: OS Zoo". Retrieved 2008-06-25. ^ Jorge G. Mare (2008-01-21). "OpenJDK Porters Group Votes to Sponsor Java Port to Haiku". Retrieved 2008-06-25. ^ Bruno Albuquerque (2008-04-01). "Haiku self-hosting.". Retrieved 2008-06-25. ^ Urias McCullough (2009-02-01). "Haiku Finally Gets a Native GCC4 - full story inside!". ^ "WiFi stack prototype works". 2009-07-14. ^ "Qt4 Ported to Haiku, Developer Preview Release Available". 2009-10-27. ^ "Haiku Project Announces Availability of Haiku R1/Alpha 2". 2010-05-10. ^ "Haiku Release 1 Alpha 4". Haiku Project. 2012-11-12.